Cooke Aquaculture must shut down and remove its Port Angeles Atlantic salmon farm after the state deemed it unsafe and illegal and canceled its lease. 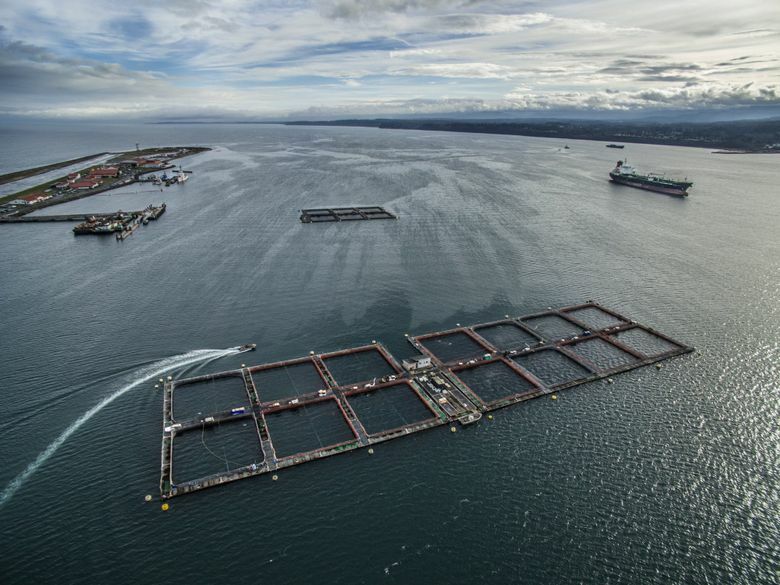 Cooke Aquaculture Pacific has lost the lease for its Atlantic salmon net-pen farm in Port Angeles and must shut down and remove it, said Hilary Franz, state commissioner of public lands, who terminated Cooke’s lease. The farm, operated by a series of owners since 1984, currently holds nearly 700,000 Atlantic salmon. Franz said the Washington Department of Natural Resources (DNR) would work with other state agencies to enforce an orderly shutdown and complete removal of the farm. At issue are risks to the public and the environment posed by Cooke’s farm on the east side of the Ediz Hook, Franz said. The farm, which comprises one large pen with 14 cages and a smaller pen with six cages, is outside the boundaries of its lease with the department and causing a navigation hazard, Franz said. The farm also is polluting the water with fragments of Styrofoam crumbling off its floats. 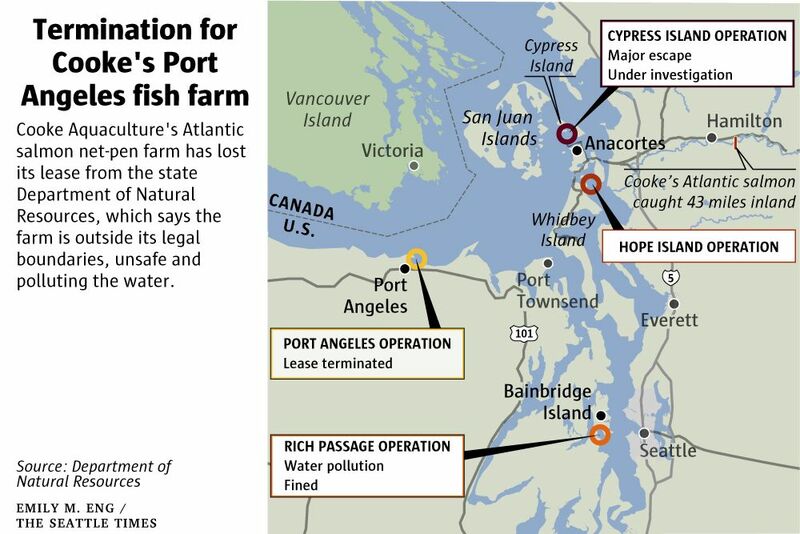 Finally, anchor lines for the farm are missing or damaged, posing a risk of collapse and fish escape — as happened last summer at another Cooke farm, at Cypress Island, Franz said. The dangers and unauthorized placement of the farm were discovered during inspections the week of Dec. 4 that Franz initiated, part of ongoing inspections she has ordered for all of Cooke’s Washington fish farms following the Cypress Island escape. Two anchor chains had come loose from their anchors, and a third had an open link vulnerable to complete failure, inspectors hired by DNR found. “As we have already seen with Cypress Island, a weakened facility poses significant threat to the Puget Sound,” Franz said. Just one month before Cooke’s Cypress Island farm fell apart, it drifted badly as half its mooring lines snapped. Cooke knew the farm needed total replacement, but elected to keep it in operation and postpone replacement until after harvest, in September. Instead, the farm, with 305,000 fish inside, fell apart the weekend of Aug. 21. The previous owner of the Port Angeles farm, Icicle Seafoods, had been questioned by DNR in October 2015 as to whether the net pens were operating outside of the lease boundaries. Icicle agreed to ensure that its net pens were fully within the boundaries by October 2016. Cooke assumed the lease when it bought Icicle the following May. DNR’s inspection this month revealed the net pens are still outside the boundaries — and discovered the crumbling Styrofoam and missing and broken anchor chains. “We are not allowing them that kind of disregard of their maintenance and lease terms to go unnoticed and unresolved, and took action,” Franz said in an interview Friday. Joel Richardson, vice president, public relations, for Cooke, said the letter of termination, which the company was informed of Friday afternoon, was a surprise. In her role as commissioner, Franz oversees 2.6 million acres of aquatic lands to ensure the public’s waters are protected and terms of leases enforced. Cooke leases public bed lands from DNR for all of its fish farms around Puget Sound. The lease termination came in the same week that the Washington Department of Ecology fined Cooke $8,000 for repeated violations of its permits for polluting the water at another one of its farms, in Rich Passage at the south end of Bainbridge Island. There, despite repeated warnings by the department, employees pressure-washed nets and trucks over the water, allowing the wastewater to flow into the Sound, and changed boat engine oil over the water, according to the state. The fine was imposed after Ecology sent two warning letters, issued a notice of violation and requested that the company fix the violations on many occasions, the agency said. Neighbors first reported the pollution back in August, and said living with the farm nearby has been a significant nuisance. “It’s the noise and the smell and the truck traffic, then they pull these nets and power-wash them, and none of that overwater washing is allowed,” said Kathleen Hansen, director of Rich Passage Estates Home Owners Association, whose house overlooks the Bainbridge Island farm. Meanwhile Atlantic salmon from the collapse of one of three farms at Cooke’s Cypress Island facility are still turning up in Washington rivers. The Upper Skagit tribe keeps catching Atlantics more than three months after that farm fell apart, dumping more than 160,000 Atlantic salmon in Puget Sound. More than 105,000 of the fish are still unaccounted for. The Washington Department of Fish and Wildlife confirmed Friday that ear bones of fish caught by the Upper Skagit crew bear the unique mark Cooke makes on its Atlantic salmon while in the hatchery. Both the company and state experts said several weeks ago that they presumed all the escaped fish are dead or wasting away. But Cooke’s fish were very much alive, and swimming more than 42 miles up the Skagit River more than 110 days after their escape. These are not the first troubles for Cooke. The multibillion-dollar corporation, with operations in several countries, agreed to pay $100,000 in fines and $400,000 in penalties in 2013 as part of a plea agreement in connection with illegal use by a Cooke subsidiary of pesticide to kill sea lice in its Atlantic salmon farms, CBC News reported. The pesticide also killed hundreds of lobsters. It was one of the largest environmental penalties ever imposed in Canada, enforcement authorities told the CBC. Cooke’s future in Washington, where it runs eight Atlantic salmon fish farms in four locations, is up for debate during the upcoming legislative session. Two GOP lawmakers have introduced legislation to terminate all of Cooke’s leases with emergency legislation that would take effect with the governor’s signature. A Democratic lawmaker also has proposed terminating all of the company’s leases as they run out; the last lease expires in 2025. Franz said that as long as the company continues to operate on DNR lands, it will be expected to maintain its farms in a clean and safe manner. “If we identify violations, we will take action immediately,” Franz said. The latest actions involving Cooke are separate from the investigation by multiple state agencies into the escape at Cooke’s Cypress Island Farm last summer. That investigation is ongoing, and could result in additional penalties and fines. The investigation and a final report on the escape are expected to be completed by mid-January.